Forensic Seismology - Aircraft accident investigation. On September 13, 1993 an RAAF F-111C jet aircraft crashed nearby the township of Guyra, NSW, Australia. During September 2013 a memorial service was held at Guyra to remember the event and the tragic loss of the RAAF aircrew. Details of the memorial service and the 1993 crash were recorded by the Northern Daily Leader, and Guyra Argus newspapers. Plaques commemorating the crash are now located at the Guyra Shire Council office and at the crash site. The exact crash site whereabouts may be viewed in Google Maps. Although the impact was heard by people on the ground, no on-board instrumentation recorded the precise time of the crash which was subsequently established by seismology. A fully loaded F-111 weighs around 40 tonnes and a high-speed impact with the ground will release the energy of a small earthquake. Located around 27km north of the Guyra crash site was a Bureau of Mineral Resources (BMR*) seismograph station, which had operated there since 1991 (* the BMR ultimately morphed into the current Geoscience Australia organisation, who still operate the near-Armidale seismograph station). Kevin McCue, then a BMR employee, got to hear of the Guyra F-111 crash whilst in Berlin, Germany and upon return to Australia he checked to see if it had registered on the Armidale seismograph. 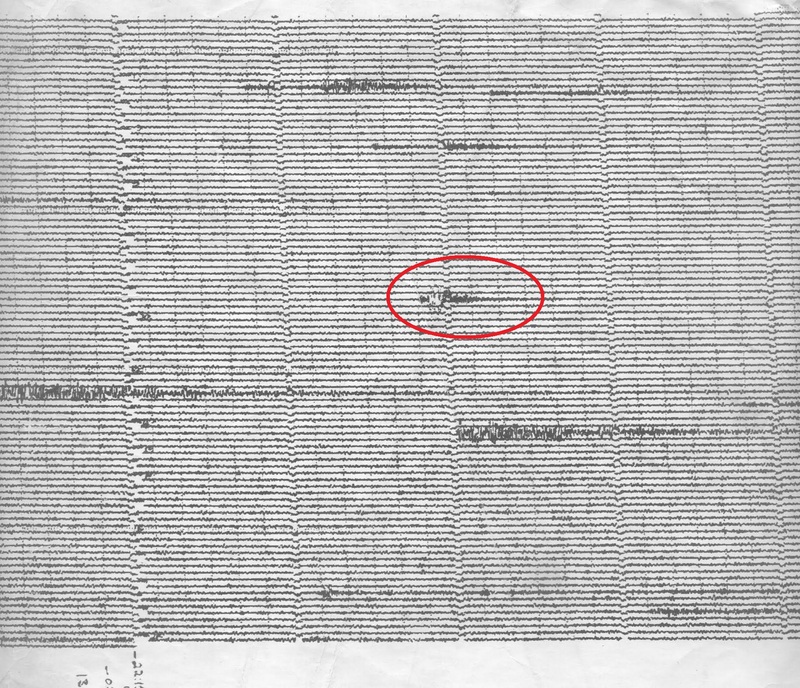 The section of the drum recorder trace from Armidale, for 13th September 1993 is shown right, and marked in red is what appears to be a local earthquake. Analysis of this trace shows an arrival time for the initial seismic P-waves of 09:16:50 UTC, with the arrival of the S-waves around 3.8 seconds later. This difference in P-S wave arrival time is perfectly consistent with an event located at a range of 26km and also implies that the true time of the event was around 09:16:46 UTC, or 7:16:46pm AEST. At this time the sun was around 21° below the horizon and there was no moon, so in regional NSW it would have been a very dark night. McCue subsequently contacted the Directorate of Air Force Safety* team investigating the crash and provided the details above, which was probably the first time that seismic observations were used by an Australian air-crash investigation (* In 2006 the Directorate of Flying Safety and the Directorate of Air Force Safety merged to become the Directorate of Defence Aviation and Air Force Safety (DDAAFS) ). More technical details of the cause of the Guyra F-111 crash are available from the Australian F-111C Aircrew Association website. Around the world seismic observations have played a role in investigating air crashes, perhaps most famously in 1988 when an Pan Am Boeing 747 airliner was destroyed by a bomb overhead the Scottish town of Lockerbie. Lockerbie is located relatively nearby a seismic listening station operated by the Comprehensive Test Ban Treaty Organisation, and the station clearly recorded the impact and was able to provide information to the crash investigation.